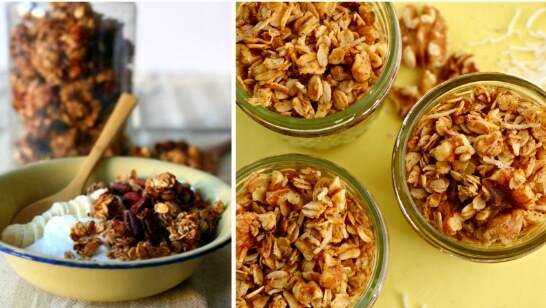 Why not rustle up a bag of our super easy to make Unbeelievable sugar free, gluten free, health boosting, granola? This stuff is so tasty, easy to make and totally addictive. Great added to yogurt with berries. Our fave way to eat it is with nut butter & chocolate chips. Combine all dry ingredients in a big bowl. Pour in coconut oil (melt a bit first in microwave if need be) & then honey, stir well & spread mixture onto the baking sheets. Put in a 120c oven for 1 hour. Your kitchen should smell pretty good by now. Take out and flip with small spatula, section by section. Not a perfect “flip”. Basically you are just moving it around a bit. Put back for 15~20 minutes, until toasty gold. Let cool for an hour. Add the contents of 5 capsules of Bee Prepared immune support (Daily Defence or Max strength- find it in health stores including Holland & Barrett- click here) & stir well. Bag it up, seal, tie with ribbon and get ready to have people love you. Store in refrigerator for max crunchiness & foodie satisfaction.